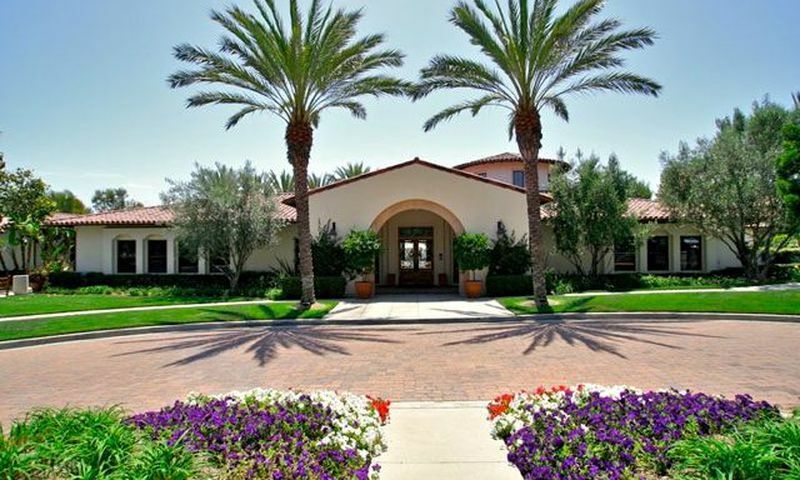 Developed by Standard Pacific between 2000 and 2004, Talega Gallery in San Clemente, California is a premier active adult community comprised of 283 elegant attached and detached homes. Centrally situated on a hill top, this gated enclave of luxurious residences for adults aged 55 or better is part of the master-planned Talega neighborhood, but has its own recreation center and community activities. In addition, residents have use of the Talega Swim and Athletic Club as well as the nearby 18-hole Talega public golf course. The 18-hole, par-72 Fred Couples Signature circuit challenges golfers of all skill levels. Residents are allowed to have two pets per household. The homeowners' association dues include landscaping, trash and sewer services. The 8,500 square-foot Gallery Club at Talega provides a refined, elegant atmosphere with a full staff of on-site management, recreational assistants and fitness instructors. With a fully equipped kitchen, an outdoor cooking area and private patios with fountains it is the ideal venue for socializing. When it is time to stay fit or get in shape, the fitness center allows residents to do so in a sunny and bright environment with four color televisions and state-of-the-art exercise equipment. Other social areas include a ballroom, card room, billiards area and library. Talega Gallery features a luxurious swimming pool and deck that is furnished with loungers, tables and chairs, making it very inviting for all to relax and enjoy life in the sun. The heated jacuzzi is also very popular. The grounds include a 9-hole putting green, a bocce ball course and a croquet course. In addition to their private amenities, residents of Talega Gallery have access to the amenities within the Talega master-planned community. The Talega Swim and Athletic Club has a clubhouse with additional social areas and a business center. Outdoors, there is a lap pool, children's wading pool, tennis court, and volleyball court. Two satellite swimming pools can be found throughout the community. Talega Gallery has four different home collections, designed to offer between 1,578 and 3,634 square feet of air-conditioned space: The Seagarden, Wavecrest, Waterleaf and Sandbridge. The Seagarden collection features attached condos; the Wavecrest and Waterleaf are comprised of one and two-story homes, and Sandbridge has one-story detached homes. Most have two or four bedrooms and two to three bathrooms. All residences at Talega Gallery have two-car garages. These refined homes exhibit the finest craftsmanship and include many desirable upgrades. Buyers can choose from a varied inventory of resale homes. Some lots even have sought-after valley views. Residents of Talega Gallery enjoy an exclusive club lifestyle where the art of fine living is a welcome priority. Here, interests embrace an assortment of active pursuits, socialization and hobbies in an enriched environment. Organized activities include a breakfast club, Monday night poker group, bingo and bocce ball. Other interest groups include yoga, theater group, knitting and line dancing. A coastal breeze keeps temperatures modest so all can enjoy the California sun and outdoor amenities of the community to their fullest. Talega Gallery is located within one mile of downtown San Clemente, California. It is part of a larger community known as Talega. A leisurely two-mile drive leads to the beaches at San Clemente. The scenic South Orange County coast offers posh restaurants and eclectic art galleries, especially in Laguna Beach and Newport Beach. Residents can also shop at the nearby Talega Shopping Center or at any of the new shops in San Clemente. Popular attractions in the area include the Casa Romantica Cultural Center and Gardens, Trafalger Street, the Historic Fishing Pier, and the Shorecliff's Golf Course. Long Beach, Santa Ana, Anaheim and Costa Mesa are all within a 35-mile radius of the community. Talega Gallery is a 55+ community in the unmatched beauty of San Clemente, CA. The Gallery Club - 8,500 Sq. Ft. In addition to the private clubhouse, residents of Talega Gallery have access to the Talega Swim and Athletic Club, available to all Talega residents. There are plenty of activities available in Talega Gallery. Here is a sample of some of the clubs, activities and classes offered here. As Talega Gallery only attached homes, Seagardens carefree quality is unique. These homes were created with attention to detail in every aspect and to optimize personal privacy. The intimate setting of the neighborhood brings out a warm and inviting atmosphere. These ideal homes range in size from 1,578 to 2,045 square feet and feature two to three bedrooms, plus a den, two to two-and-a-half bathrooms and a two-car garage. Wavecrest is a collection of classic architectural style with spaciousness and refinement. There are four floor plans that range in size from 1,747 to 2,257 square feet. These homes feature two to three bedrooms, two to three bathrooms and a two-car garage. Waterleaf is the perfect blend of simple and luxurious. These designs provide a sense of comfort and flexibility with at least 2,032 square feet of living space. These homes feature two to four bedrooms, two to three bathrooms, and a two-car garage. Additional options are available including a loft, a study, a quest suite, and an office. Scenic panoramas and intimate cul-de-sacs set the collection apart from the rest. Sandbridge has four floor plans featuring two to four bedrooms, two to three bathrooms and a two-car garage. Homes range in size from 2,410 to 3,634 square feet and are designed with open living space and have a den and master suites on the first floor. Great location in a private gated setting and still convenient to lots of great restaurants, golf, shopping and everything you'll need. It's only about 15 minutes to downtown San Clemente and the beach. This community is very prestigious feeling and has all the bells and whistles we wanted while not being too big. The homes and community is very well maintained here, landscape always looks great and people take pride in their curb appeal. Really nice! 55places.com is not affiliated with the developer(s) or homeowners association of Talega Gallery. The information you submit is distributed to a 55places.com Partner Agent, who is a licensed real estate agent. The information regarding Talega Gallery has not been verified or approved by the developer or homeowners association. Please verify all information prior to purchasing. 55places.com is not responsible for any errors regarding the information displayed on this website.